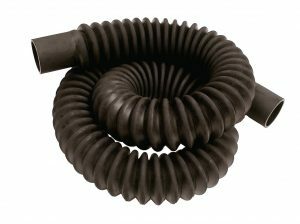 Garage exhaust hose is designed to safely transfer hazardous exhaust fumes out of a work area using a fan system or directly through a garage door porthole. Resistant to high heat, exhaust fumes, and gas and oils commonly found in auto shops, this hose can also be run over and regain its shape. Most sizes feature a flared end that threads directly into the next length without the need for clamps or couplings, making an entire assembly crush-proof and easy to install. Extreme temperature products include wire reinforced silicone coated fiberglass to 600 degree rating.